As a teacher I am always looking for ways to practice multiple skills at one time. These Super Sentence pages do just that. 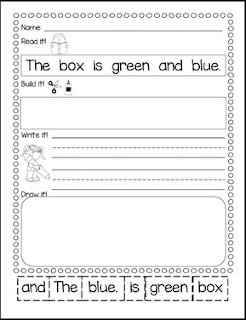 Your students will practice reading, writing and comprehension all in one page. *Read It – I encourage my students to read the sentence independently and touch each word as they read . 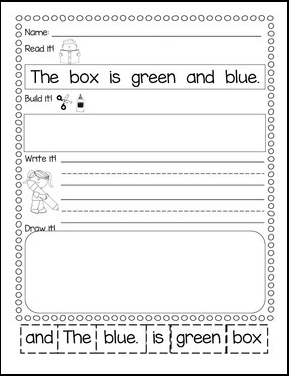 *Build It – Students will cut the words from the bottom of the page and build the sentence correctly. Having the sentence at the top of the page allows the students to practice a proper sentence using matching as necessary. *Write It – Students will copy the sentence and write it on the lines provided. Encourage students to use proper handwriting and spacing during this step. *Draw It – Students will illustrate the sentence. If students have read the sentence independently then you have a chance to assess reading comprehension in this section.